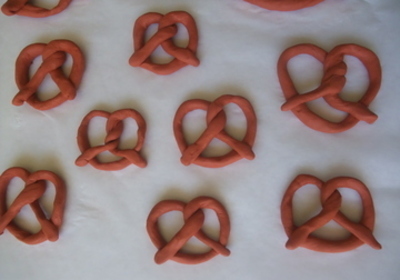 This is a fun, sticky craft activity: make your own clay pretzels. Roll the clay in your hands for a minute or two until warm. Roll a piece out like a worm on a non porous surface, like a plastic chopping board. Make the pretzel knot. The bigger the pretzel the more twists you can put in it, the smaller the pretzel, less twists. Leave your pretzels to air dry for 24 hours. 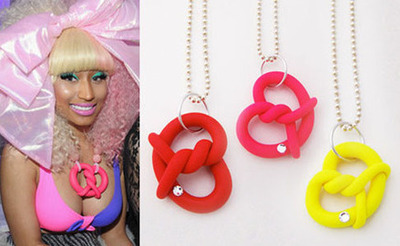 Once dried you can paint them bright colours using neon acrylic paints and pop them on a piece of string, aka Mz Minaj. There's an Alien in the highchair!